When I come to the states, with apologies to all who’ve urged me to check out a croissant, Kouign amann, or macaron shop, since I can get all those things pretty easily in France, I tend to stick with local favorites. I don’t think anyone from San Francisco is coming to Paris for a burrito, nor in anyone flying over from Brooklyn in search of the perfect bagel in Bordeaux. Yet serendipity found me in New York at the same time as British baking pal Edd Kimber, so I decided to break my rule for SuperMoon Bakehouse, which is offering a decidedly different take on classic French pastries. 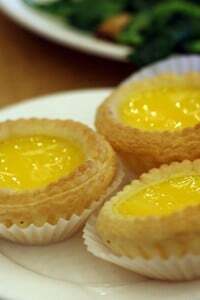 I’m not a huge fan of fussing with tradition, when it’s only done for the sake of being audacious, but some of the pastries sounded intriguing enough to brave rush hour on the packed New York subway, to high tail it over there, early this morning. 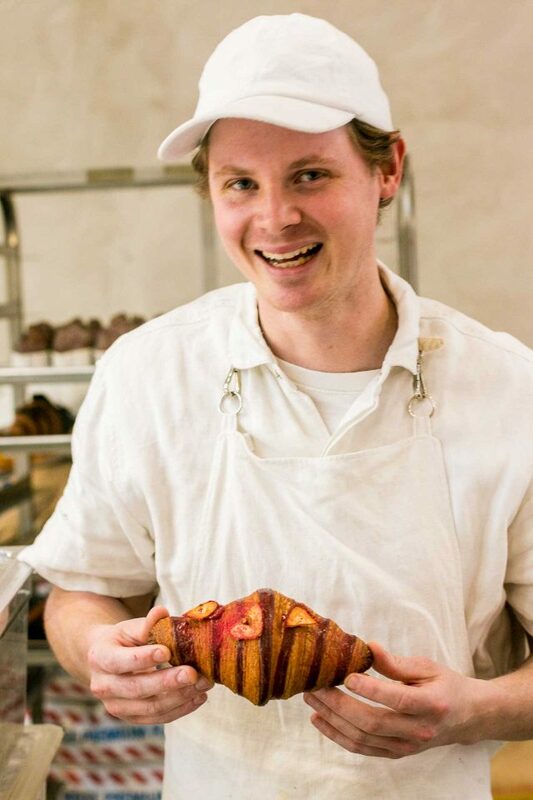 Ry Stephen baked at Mr. Holmes bakery in San Francisco, where people lined up at the Tenderloin address, starting early in the morning, in hopes of getting one of his cruffins, a cross between a muffin and a croissant. I don’t love standing in line for a pastry, but I love my friend that I stay with in San Francisco, and she insisted that we go. 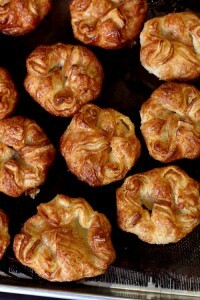 We never got a cruffin, as they’d run out, but we ended up with a box of rather delicious pastries nonetheless. If memory serves me right, Ry saw my social media post about it and told me next time I come, to say hi to him. He didn’t quite seem to remember me when I stopped in his New York City bakery, but he’s friendly and engaging enough to feel like an old friend, and I was happy to finally meet, even though I’d already snagged a cruffin, while I waited for Edd to arrive. At a recent book event, someone asked how I felt about the quality of croissants in France. 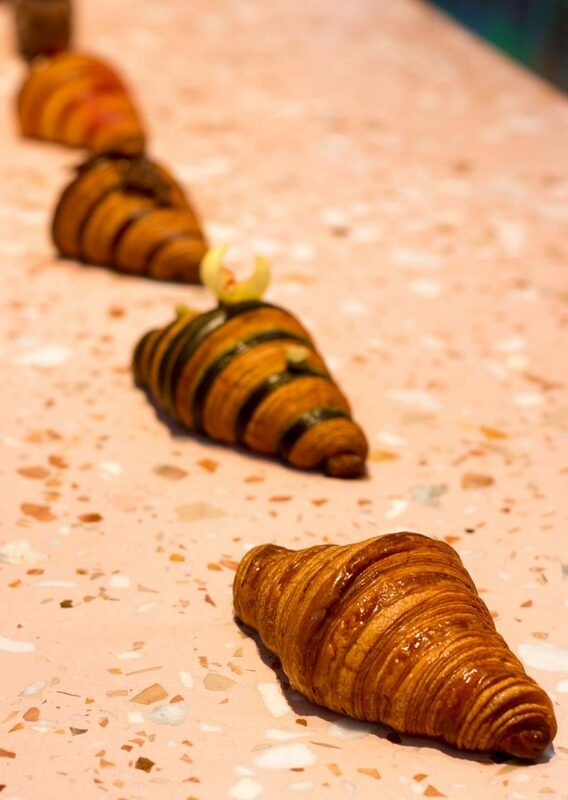 Croissants in France are not presented – or priced – like individual crescent-shaped Gods. They’re often stacked on a tray, and handed over quickly in a sheet of paper, tied in a knot on top, or in a little paper sack. 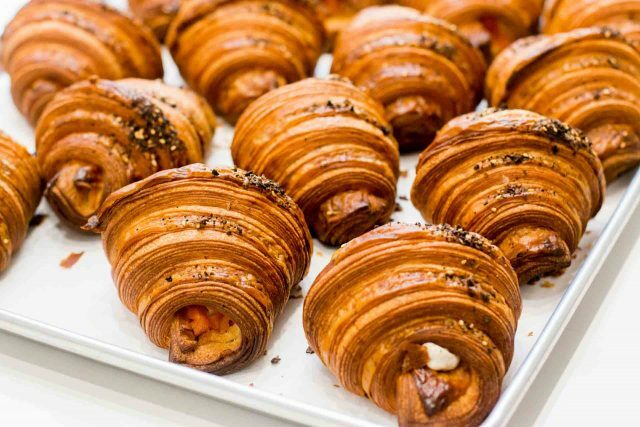 They usually cost around a euro and a lot of fuss isn’t made over them because they are ubiquitous, showing up in almost every bakery in France – as well as sold by the dozen in sacks at supermarkets and frozen food stores. There are so many that there are bound to be good ones (youpi! ), and not-so-great ones (merde). 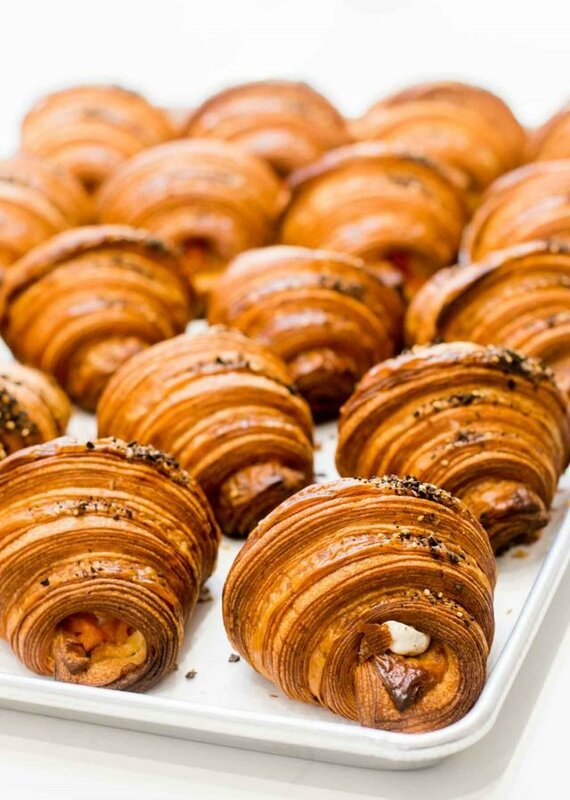 Each croissant at Supermoon Bakehouse takes three days to make, except for the seasonal one they had on offer today with candied pecans and brown butter filling, lemon confit and torched meringue, which takes them four days to put together. Some of the creations are, to be sure, Instagrammable (and there were a number of people who I think may have been prominent Instagrammers in the shop, shooting and posing, while I, the dinosaur of the internet, lugged my DSLR along), but the baker has the chops to prove that he’s more than just a piled high photo of a pastry with a gazillion of likes. Ry is the real deal. Originally from Australia, most of his training was in France. Now stateside, he only uses the highly esteemed Beurre d’Isigny for his yeasted puff pastry. He wasn’t aware of the current butter shortage in France, so perhaps I found the culprit? To keep all the pastries pristine, each is lined up on trays, not overlapping, which Ry pointed out tends to lop off the top of the center, of the downward facing “point,” which is the most visually appealing part. I still like the crunchy ends the best, although I made such as mess while eating at one of the low tables that there was not an unsubstantial pile of buttery shards around us when we left. I did make a suggestion that they install a hand sink on the premises because my hands were a flaky mess when we were finished. And they might want to park some handheld vacuums around the room, too, although I did the best I could cleaning up after we demolished our pastries because I was kind of embarrassed at how I’d attacked the pastries. 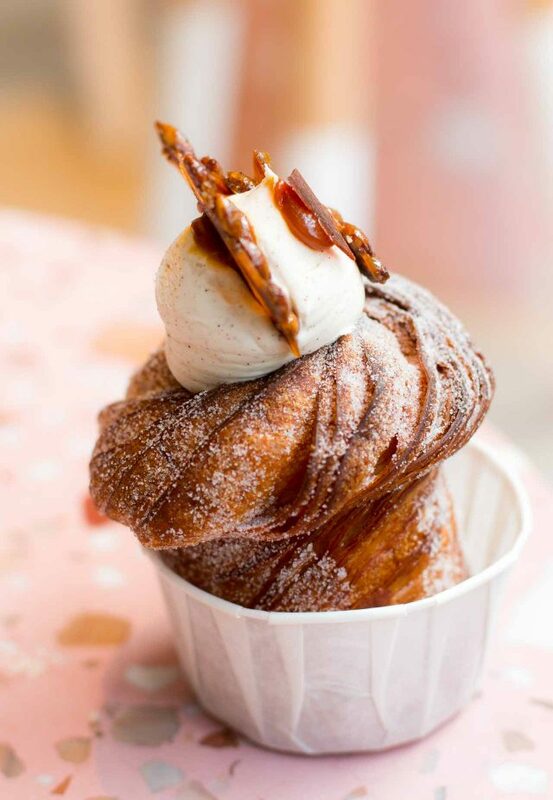 The famed Cruffin was excellent, and seasonally inspired. (The flavors and fillings change frequently so don’t expect the same ones to be around if you go in.) This one was filled with pumpkin-pumped pastry cream, pumpkin caramel, a boule of cinnamon cream, and pumpkin seed brittle. 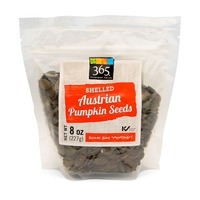 When I told Ry that Whole Foods has the absolute best pumpkin seeds, from Austria, I must’ve sounded too enthusiastic because wondered aloud if I worked for them. I said “No.” Then I made a note to go over there asap and buy as many as I could, because from the gleam in his eye, he was heading over there right after he got off work. I need to go back (to his bakery, as well as Whole Foods), hopefully soon. Not just because Ry invited me to come and roll out brioche dough any time I want with them, which sounds like a lot more fun than wondering whose holiday festivities I’m going to crash this year. But because the bakers wear these comfy-looking linen-like cotton shirts and aprons, not the stiff polyester ones bakers usually have to wear, and I want one of each. Plus I need to get some photo tips from the Instagrammers since my pic of Ry didn’t come out as well as I’d like, so I’m going to replace it with a better one. Maybe I’ll leave my bulky camera at home next time, and get with the times. Open at 8am, until sold out. 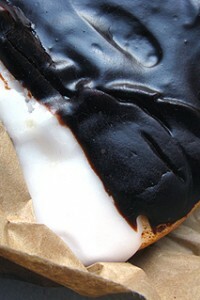 Absolutely tantalizing and delicious looking…wow…I want one now! Your pictures have more character. He comes across in that portrait. Just completed reading your book, L’appart. Bravo! Very entertaining but not fun as you lived through the renovation. I too am an American living in France…the lovely countryside of Normandy. Can relate to some of the challenges. Just think your beautiful apartment will be waiting for you when you return from your book tour. 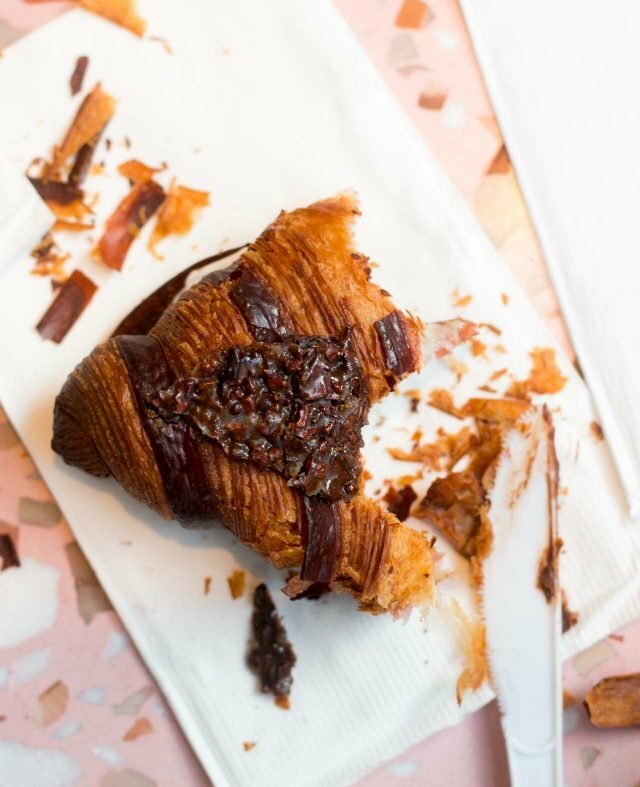 Although I was enjoying a faulous slice of my Cranberry Cream Chesse Bread along with my coffee as I read this post, I was truly longing for one of those amazing croissants. The photos are fabulous. Took a look at Supermoon’s website, with descriptions of their products. There wasn’t one thing there that didn’t totally turn me off. David, your description of leaving a crumb-y mess thanks to your enthusiastic consuming of flaky pastry and asking the bakery to install a sink is what makes you you! Thanks for the chuckle and the description of your experience, including apron envy. The Lower East Side certainly ain’t what it used to be, at least regarding food places and apartment prices. It still looks pretty…well, crumby. David, have you noticed that croissants made in the U.S. are baked to a dark bronze as opposed to the ” real ” ones in France that are baked to a golden color? I judge croissants by the mess they leave. The shards are the best part. In the Seattle area Bakery Nouveau’s are the best, and I can attest to their messiness. 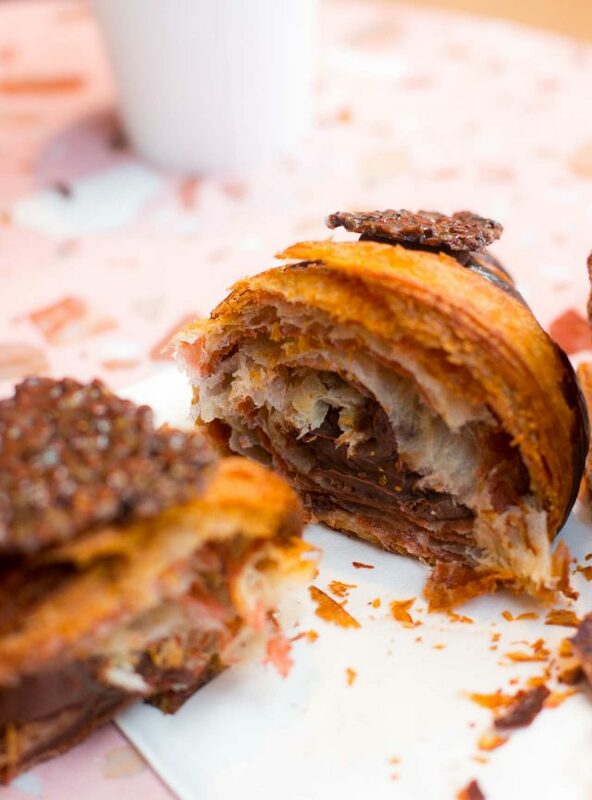 Your picture of the interior of the chocolate croissant nearly made me lick the screen. Drool worthy. I thoroughly enjoyed the most recent book but wished it would have had photos of the fabulous new apartment. I just wanted to say that I devoured your new book and own most of the others. I find your recipes are always very dependable and I thank you for giving them in grams. Having built two houses here and done several deep renovations, I don’t find your experiences all that unusual, althougoh you relate them very amusingly. I think everyone would love to see some pictures of this place! Thank you again for your wit and recipes. I can’t even believe how incredible these look – wow, the love and perfection! also love the over the top glamour boxes – in this case they are warranted! Hi David, I have a query on the creme caramel recipe but I am unable to leave the comment there hence writing it here. Apologies for that. In the creme caramel recipe it says for the caramel to use 1 cup sugar i.e. 200 gms. Then shouldn’t the sugar in the custard be 133 gms if it is 2/3cups. Am confused as it says 170gms. Please clarify as i do not want to add more sugar than needed. Again, apologies for writing this query here. I’ve been hunting Rugelach recipes for the season..and when I saw how these croissants were rolled with the filling..rugelach came to mind. These look very good..I like the ends crispy and the center a little less dark and crisp..but that’s just me! I’d never turn these down..fwiw! Love your latest book ! Can’t wait to try some of the new recipes. Merci. 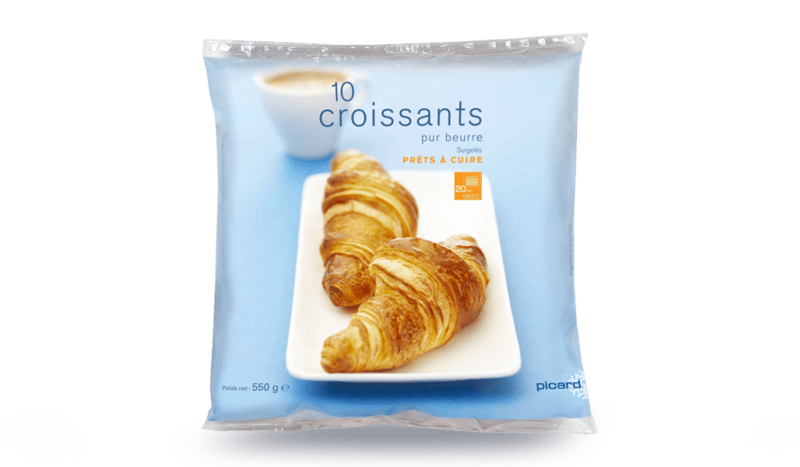 Call me a philistine but the frozen croissants now on sale when baked produce a croissant crisp, flavourful, and flaky that reminds me of Paris. 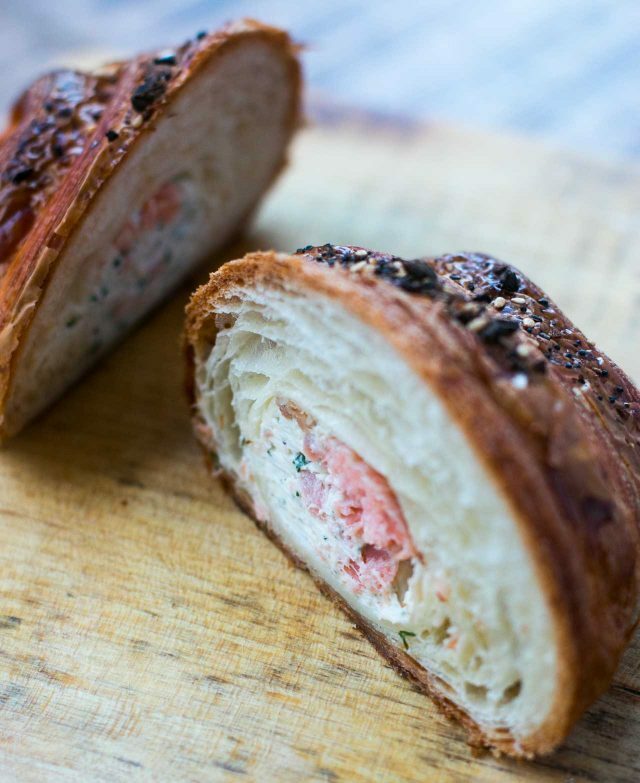 Just when you think croissants can’t get any better!! I love absolutely plain croissants! They are perfect! These creations appear, pardon my Yiddish, tsu fil ongepatchket! I love absolutely plain croissants! They are perfect! The textures, the taste, the aroma. Only the merest dab of jam and that really is gilding the lily. So these creations appear, pardon my Yiddish, tsu fil ongepatchket! I love their Oreo doughnut. 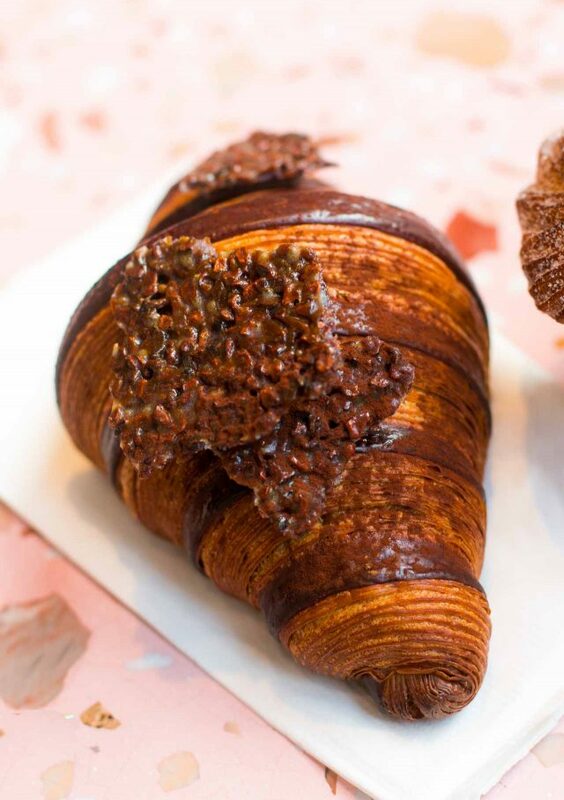 They use a chocolate brioche with Oreo crème pâtissière. I tell myself that I won’t go in, but I always do.